Nicholas NORTON (ca. 1610 – 1690) was Alex’s 10th Great Grandfather; one of 2,048 in this generation of the Shaw line. He was also Alex’s 9th Great Grandfather, one of 1,024 in that generation of the Miller line. The two lines didn’t come together for 350 years until I was born in 1959! 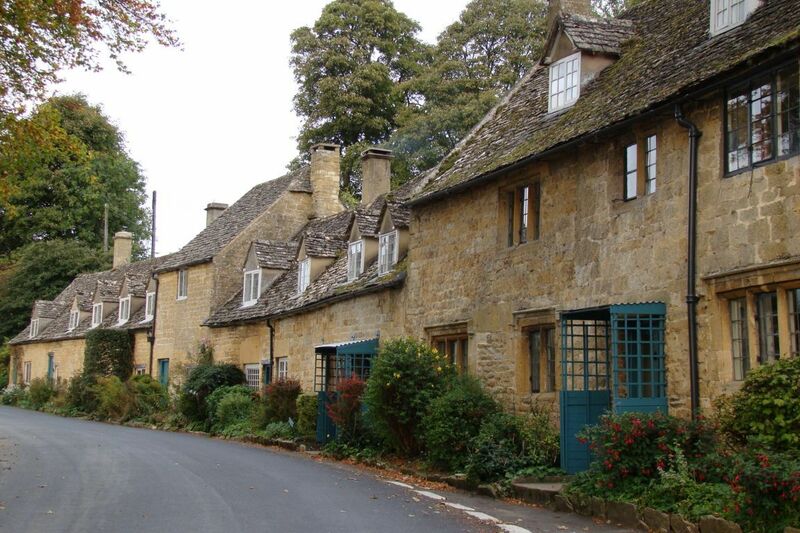 Nicholas Norton was born about 1610 in Broadway, Somerset, England. 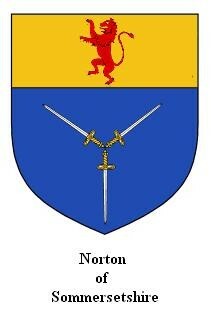 His parents were Nicholas NORTON Sr. and [__?__]. He emigrated to America in 1635, probably coming with the party of colonists accompanying Rev. John Hull. On the ship “Hopewell” which left England in Sept 1635 was: Norton William 25 – Sworn August 29, 1635. He probably came with the party of colonists accompanying Rev. John Hull. (See my article The Hull Company.) He married Elizabeth ISAAC in 1637 in Weymouth, Mass. Nicholas died in 1690 in Edgartown, Dukes, Mass. Elizabeth Isaac was born about 1617 in Weymouth, Dorset, England. Her parents were Joseph ISAAC and Elizabeth [__?__]. Elizabeth died about 1690 in Edgartown, Mass. 4 OCT 1676 Woburn, Mass. 1637 – Some sources state that Nicholas was a veteran of the Pequot War. 1637 – Nicholas first appears at Weymouth, Mass., where he married his wife Elizabeth, and in which place he maintained a residence for twenty years prior to his removal to the Vineyard. 1658 – That he was of a social station somewhat above the average appears from the fact that he kept a servant, whose “miscariages” brought the subject of this sketch into trouble with the magistrates of Massachusetts. The following petition explains the case as related by Nicholas Norton himself to the General Court. The Court granted his petition providing he should bring his servant to bar. That whereas yor poore peti’or stood engaged to the Treasurer in the sume of five pounds to bring in his servant to a County Court held at Boston to give answer for sume miscariages Comitted, which accordingly he did, at which Court yor poore peti’ors servant was also pr’sented by the grand-Jury either for the same or for some other offenses, the Court was then pleased, to deferre the Issue of the Case, & to require the Coutynuatio of the sd bond of yor poore peti’or, where upon he did agayne engage himselfe in the foresd sume to bring in his sd servant to the last Court of assistants, but in regard he was under a pr’sentment, expected to have him sent for by warrens & that wittnesses should also have bin sent for to prove the same as is usueall in case of pr’sentments, where upon vor poore peti’r, through Ignorance of the manner of Courts p’ceedinges in such Cases hath forfeited his foresd bond. 1659 – While still called “of Weymouth,” Nicholas’ name first appears in the records of Edgartown, a town located on Martha’s Vineyard. Edgartown was first settled by the English in 1642. Rev. Thomas Mayhew, Jr. led a group of families to start a colony on the island after its purchase by his father. Edgartown is famous for being the site of Chappaquiddick and its population was 3,779 at the 2000 census. Nicholas was chosen a referee to represent the town in its controversy with John Daggett respecting his farm at Oak Bluffs. Nicholas Norton was one of the first share holders of Martha’s Vineyard – On Aug. 22, 1659 “Goodman” Norton was granted “a Lott of forty acres of Land” located north of the Great Swamp and south of the present road to West Tilsbury. He also owned land at Sanchacantackett in the vicinity of Major’s Cove where his descendants lived for two centuries, and he owned a plot of meadow land at Aquampache. 22 Aug 1659, “Goodman” Norton was granted “a Lott of forty acres of Land” and on the same day it was” ordered by the town that Goodman Norton shall have Liberty to make use of any Pond about the Ox Pond for his Trade, except the Great Ponds.” It does not appear what trade Nicholas Norton followed, but the use of ponds suggests that he may have been a tanner. 1659 – Sued by Henry Goss in that year and was mulcted in the sum of five shillings “for charges about the cure of Mr. Gousse’s child: to pay one half in Wampam current and halfe in come and five shillings to the constable for the Tryall about the abuse of Mr. Gousse’s child.” The exact nature of this suit at law is not clear from the records. 1659 – Sued the Rev. Mr. Cotton, missionary to the Indians. 1661 – One of a committee to buy land of the Indians for the use of the town. 1662 63 and 1669, he again appears in litigation with various townsmen, and if not a pattern in this respect, his fence was deemed the pattern and lawful standard to which others were required to conform in the maintenance of boundary fences in the town. 1666 – Forbidden by the proprietors of the fish weir from taking any fish at Mattakeesett Creek, the right to which he claimed by purchase from the sachem Tewanticut, “contrary to our patent,” upon a penalty of £5 yearly so often as he disobeys the order. 1673 – Joined in the ” Dutch Rebellion ” with others of his townsmen, and when it had collapsed he was tried, convicted and forced to pay a fine of L51. To be honest, it wasn’t purely Athearn’s democratic spirit rebelling. It was also his purse. As Lord of the Manor, Mayhew had the right to charge Athearn and others rent for land that they owned and already paid taxes on. The agitation and political proactivity of Athearn (and others) made the Island’s secessionist movement some three hundred years later look severely anemic. Most officeholders on the Island were Mayhews; most members of the judicial system, likewise. Because officers did not pay taxes, and the Lord of the Manor got to decide how taxes were spent, the effect was that non-Mayhews paid all the taxes and Mayhews (especially Thomas Mayhew) decided where all the tax money went. There was no incentive for the tax money to be spent on non-Mayhews’ welfare. Simon Athearn was enraged by Mayhew’s assumption of titles and attendant privileges, but he had no means, or even right, to complain – until 1673 when the Dutch retook Manhattan and reestablished New Amsterdam. Thomas Mayhew’s Governor-for-Life-etcetera gig was legally founded in the power of the governor of New York. Suddenly, there was no governor of New York – because there was no longer a New York! That meant Mayhew was no longer governor – at least, according to Simon Athearn and about half the European population of the Vineyard. Mayhew himself, though, remained Zeus-like, supremely indifferent to his supposed loss of power. He carried on as though he were still in charge, and in effect, he was. Athearn: We’re petitioning to have Martha’s Vineyard made a part of Massachusetts rather than New York, seeing as how New York doesn’t really exist. We hope you’ll join with us. Mayhew: I think things are fine the way they are. Athearn: But Massachusetts is closer to us, and more efficiently run, and more democratic. Mayhew: Three excellent reasons why I want nothing to do with them. Athearn: Oh. Um. Okay. Well, we also have this other petition, which abolishes the role of Governor for Life, and says we’ll hold elections for a governor next year. So will you sign this one? Mayhew: You’ve got to be kidding. Simon Athearn’s 1694 rough Island map, now in the Massachusetts State Archives, was published in Arthur Railton’s The History of Martha’s Vineyard . Athearn and the others, determined to bring about change, tried a new tack. They sent their petition directly to the governor of Massachusetts, asking that he make the Vineyard part of his colony. This would effectively dislodge Mayhew from his pedestal. Governor John Leverett, however flattered he must have been to be so courted by unwashed, ragged rebels from an under-populated island, turned them down. “[It would be] His Majesty’s pleasure, whether [or not] to establish your own government or to settle you under some other…colony’s,” he cautioned them (in far worse English than that; I have taken the liberty to modernize his secretary’s spelling). In other words, only His Majesty the King of England could save them from His Majesty the Mayhew of Tisbury. There is no record of Simon Athearn and his cohorts taking the logical next step of writing to the king. Instead, they warmed to their roles as rebels by forming a rebel government. It was entirely ineffective and does not seem to have done much of anything beyond protesting the validity of Mayhew’s governance. This proved to be an unfortunate party platform for them: In November of 1674, per the above history lesson, the British retook Manhattan. Once again New York legally existed. As did the New York governor – and the validity of all the New York governor’s proclamations. Which meant Thomas Mayhew was officially, once again, Governor for Life. Governor Mayhew accused the rebels of various crimes. Their status was determined, per the rule of law, by the chief magistrate of the courts – who happened to be Governor Mayhew. Some rebels were fined, and some fled the Island. Simon Athearn got the harshest treatment: He was arrested and faced deportation to New York for trial. At this point, the impetuous Athearn did something uncharacteristically cowardly: He ratted out his compatriot Thomas Burchard in a plea-bargain arrangement. In exchange for naming Burchard as the head of the rebel conspiracy, Athearn escaped deportation to New York, gave the court (that is, Mayhew) a few head of cattle, and was allowed to go free. Burchard, strangely enough, was apparently never charged with any crime or even fined for malfeasance. 1685 – Committee “chosen to make the Govenors Rate” and this is his last appearance on the town records before his death. There is no consolidated record of his real estate holdings such as was entered by others proprietors. He lived on his forty acre grant situated north of the Great Swamp and south of the present road to West Tisbury. He was an early owner of land at Sanchacantackett in the vicinity of Major’s Cove, where his descendants for two centuries resided and improved that beautiful estate. These purchases were made of the Wampamoag Indians or “Sam” and Thomas Sisseton, both of which are unrecorded, though it is said that the original deed from “Sam” was in existence in recent years in the hands of a descendant. It is not believed that he ever resided on this property. He also held the usual proprietor’s shares in the various divisions of town lands, besides a plot of meadow land at Aquampache. At the ripe age of four score years Nicholas Norton died, leaving four sons and six daughters, at least two of whom were born in Weymouth. 17 Apr 1690 – Date of Nicholas Norton’s will. fourthly I give my Son in law Thomas Wolling on halfe Commonidg with all prevelidges belonging to it with a pese of medow from Izak Norton’s medow to the Creeke abofe named. fifthly I give my Son Joseph Norton a tract of land lying at Saniacantacket joyning to the mill Creke which I bought of Mr Sam. Ninthly I doe apoynt my Sayd wife Elizabeth Norton to be my Sole Execitor and to performe my will as abof whritin. The Last will and testament of me Elizabeth Norton widow I doe give to my fouer dafters named in my husbons will, five Shillins to Each of them. fourthly I doe apoynt my Son Joseph Norton to be Exe citor to this my will to pay all my depts and delever out all my legasys treuly and faythfullv acording this my mind and will. 1- JOHN, b. abt. 1590. 3- JAMES (?) bur. 1678 at Broadway. 4- JOSEPH, bapt. 3 Feb. 1607. 5- NICHOLAS, b. 1610 (the emigrant). He deposed in 1676 aged 66 years. 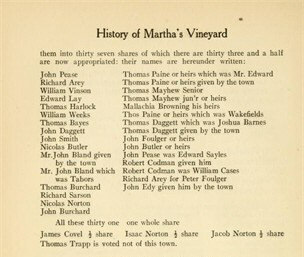 The occurrence of the names Joseph and Nicholas in the Broadway family which were also distinctive in the Vineyard family together with other collateral circumstances makes it practically certain that we have here the parentage and home of the first of this family to settle on Martha’s Vineyard. All other clues have been carefully followed out and give no such marked combination of the probabilities as does this, and the author is satisfied that it is the right solution. Joseph was one of the leading citizens of Martha’s Vineyard and its first representative to the General Court of Mass. in 1692. He was sheriff of the county in 1699 and was commissioned as Justice of the Court of Common Pleas in 1702. 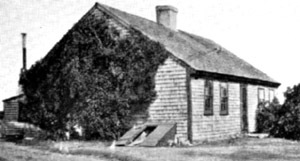 One of the first houses built in what is now Oak Bluffs was built at Farm Neck by Joseph Norton before 1670. It stood near the half-way watering place on the highway that leads from Edgartown to Vineyard Haven. A description of this house will apply to nearly all the houses built at that time. With two or three exceptions they were of one story; large on the base and low in the post. They were always located near springs of fresh water, or where water could be had by digging shallow wells at which old-fashioned sweeps could be used. Another interesting fact is that near the site of these ancient dwellings can be seen old pear and cherry trees, which tradition says were planted soon after these houses were built The frames of these houses were of oak and pine which grew near. There was a saw pit he the neighborhood, to which these great trees, many of which were three feet in diameter, were hauled by oxen and sawed into convenient dimensions by hand, one man in the pit and another above. Foundation and cellar walls were of old field stone; one hardly, if ever, finds a stone that has been split by drill or wedge. The chimneys were very large, many eight feet square at the base, made of crude bricks burnt in the neighborhood The lime used to make the mortar was as of the very best quality, made by burning oyster, clam, and other shells found along the shores. Specimens of it are as hard as rock at the present time. Another kind made mostly of clay was used where it didn’t come to the weather. The rooms were arranged conveniently for use, a small front entry, with stairs leading to the chamber from it. Two large front rooms to the right and left, usually sixteen or eighteen feet square, and always on the southerly side of the house. The panel work over the fireplaces in these rooms was very elaborate and is now considered worthy of preservation. The “beaufat” must not he forgotten as it was the receptacle for the best china and silverware which the house afforded. Next was the large kitchen in the rear, with its fireplace eight by six feet, in the center of which hung the trammel used to hold the great kettle for the cooking of the savory meals for the large families of those days. To the right and left of the kitchen were four rooms used for sleeping and storerooms. The “up stairs part” of the house was divided into two sleeping rooms and the “open chamber,” which was used for storing everything from the India shawl to grandfather’s chair. This was also used as the spinning and weaving room, for the housewife made all the cloth and linen used by the family. Ruth’s husband Moses Cleveland was born 1 Sep 1651 in Woburn, Middlesex, Mass. His parents were Moses Cleveland and Ann Winn. His maternal grandparents were Edward WINN and Joanna SARGENT. Moses died 30 Oct 1717 in Southold, Suffolk, New York. Esther’s second husband Jonathan Dunham was born 1661 in Falmouth, Barnstable, Mass. His parents were Jonathan Dunham and Mary Cobb. Jonathan died in 1745 in Edgartown, Dukes, Mass. This entry was posted in 12th Generation, Be Fruitful and Multiply, Double Ancestors, Immigrant - England, Line - Miller, Line - Shaw, Pioneer, Public Office, Veteran and tagged Martha's Vineyard. Bookmark the permalink.